General Description: The lecture provides a comprehensive introduction to modern X-ray astronomy. Besides the technological basics of the X-ray telescopes an almost complete overview on astronomical X-ray sources from individual stars to quasars at cosmological distances is presented. You will learn how to disentangle the 3-D distribution of the Milky Way interstellar medium by soft X-rays. Why clusters of galaxies interact and how astronomers deduce from these events the structure formation of the universe. You will be faced with the physics of supermassive black holes located in the very center of the active galactic nuclei. Here we focus in particular on correlation analyses of X-ray and radio data, which both trace the immediate neighbourhood of the supermassive black holes. At the end of the course, we offer a "hands on session" on real X-ray data. In 1895 Wilhelm Conrad Röntgen discovered the so-called X-radiation. He studied the X-radiation within the short periode of three month in such a detail, that it lasts ten years until the next major break through happend; Max von Laue disclosed the electromagnetic nature of the X-ray radiation using crystal layers for defraction. Today, X-ray astronomy is in a "golden age". With ESA`s XMM-Newton (left) and NASA`s Chandra (right) X-ray observatories, the whole space can be explored. In this lecture you will learn how to use these telescopes, you will understand how the X-ray mirrors and the detectors work. Galaxy clusters are the most massive collapsed structures in the Universe. Their distribution and masses can be used to place strong constraints on cosmological models. Clusters are also the largest physical laboratories available for studying hydrodynamical processes such as shocks, sound waves, and contact discontinuities; mergers of galaxy clusters are the most energetic events in the Universe since the big bang. 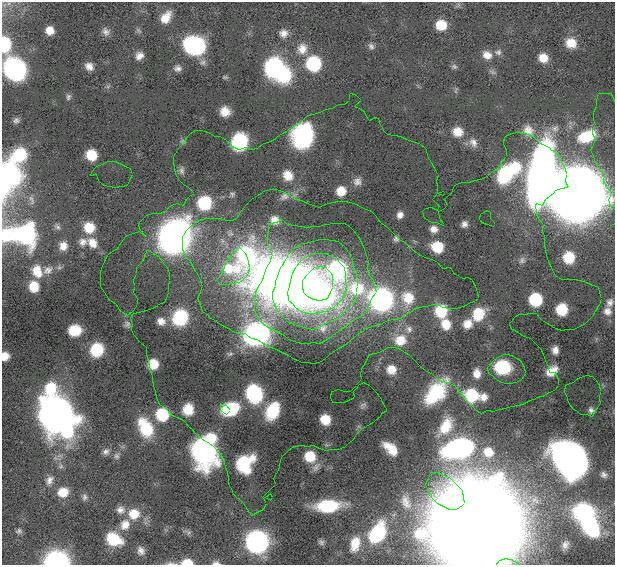 Optical image of the central parts of a galaxy cluster at redshift z=0.5 with Chandra X-ray surface brightness contours overlaid. The X-ray peak is almost exactly conicident with the brightest cluster galaxy. The X-ray emission shows some structure as well. Note also the distorted image of a strongly lensed background galaxy to the right of the central galaxy and the X-ray center. Both X-ray and optical data clearly indicate a large mass concentration. 6.5m MMT Megacam data from T. Reiprich/T. Erben, Chandra data from A. Vikhlinin. Click here for more on this. X-ray gas temperature and surface brightness map of a nearby galaxy cluster from XMM-Newton (left) and, for comparison, snapshot of the temperature and surface brightness distribution of a hydrodynamical cluster simulation (right). This cluster has two interacting components: a main subcluster to the southwest and a smaller subcluster to the northeast. The smaller subcluster appears to be leaving a trail of cold (blue) gas behind on its journey through the intracluster medium of the main subcluster. Click here for more (e.g., the movie) on this. Chandra image of the core of the nearby Perseus galaxy cluster (left). The point like emission in the very center is caused by a supermassive black hole and is assumed to be responsible for blowing the huge roundish cavities in the X-ray surface brightness. On the right an unsharp-masked image is shown, indicating the presence of sound waves, probably caused by the activity of the black hole. It's possible that cooling intracluster gas settles into the center and "feeds" the black hole giving rise to recurrent outbursts (which may prevent further cooling for a while). From A. Fabian. Click here for more (e.g., the movie) on this. Chandra image of the galaxy cluster A2142. Note the bow shaped surface brightness discontinuity to the northwest of the cluster center, apparently a shock front. But, no, through X-ray spectroscopy one finds that the denser regions of the intracluster gas are actually cooler, indicating that this feature is not a shock front but rather delineates a dense subcluster core that survived a merger. From M. Markevitch. Click here for more on this. Until recently, there was widespread believe that large amounts of intracluster gas would cool on relatively short timescales (~Gyrs), at least in the dense cluster centers. High resolution X-ray spectroscopy with XMM-Newton showed that this simple picture cannot be true. 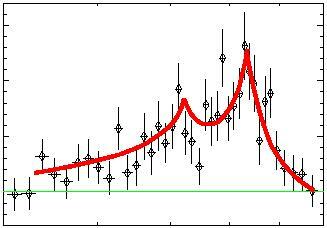 The image below shows in dark blue the prediction of the simple model and the actual data of the galaxy cluster A1835 in red (the histogram with error bars). Several emission predicted emission lines are missing in the data, indicating a deficiency of cool gas. Possibly, gas is being heated by recurrent supermassive black hole activity as seen, e.g., in the Chandra image of the Perseus cluster core (above). From J. Peterson. Click here for more on this. The centers of most (if not all) galaxies harbour a central supermassive black hole, hundreds-of-thousands to billions times more massive than the Sun. In the very vicinity of such extreme mass concentrations various emission mechanisms can produce extremely bright X-ray emission. Synchrotron and Inverse-Compton emission occurs related to the formation of collimated relativistic outflows, the so-called jets of active galactic nuclei. Moreover, reprocession of optical and soft X-ray photons from the accretion disk around supermassive black holes in a hot, tenuous corona around such disks can produce a strong X-ray continuum that reveals the physical conditions and processes from within a few Schwarzschild radii, close to the event horizon of the central black hole. Modern X-ray astronomy has started to disclose the underlying physical processes and refines our knowledge of active galactic nuclei. The powerful FR II radio galaxy Cygnus A as seen by Chandra. Two back-to-back ejected radio jets from the bright nucleus (invisible in this X-ray image) run into the extragalactic medium and form bright "hotspots" in which particles are accelerated to relativistic energies. 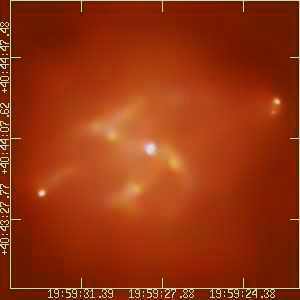 The released energy drives shocks into the intergalactic medium, forming bright "arcs" of X-ray emission that span hundereds of kiloparsecs in size. The Low-Energy-Transmission Grating onboard Chandra allows high-spectral-resolution X-ray spectroscopy of bright point sources, as e.g., the quasar 3C273. A fraction of the photons from the central on-axis point source is dispersed along a one-dimensional line with the lowest photon energies being re-directed farest from the center. The result is a spatially resolved X-ray spectrum. 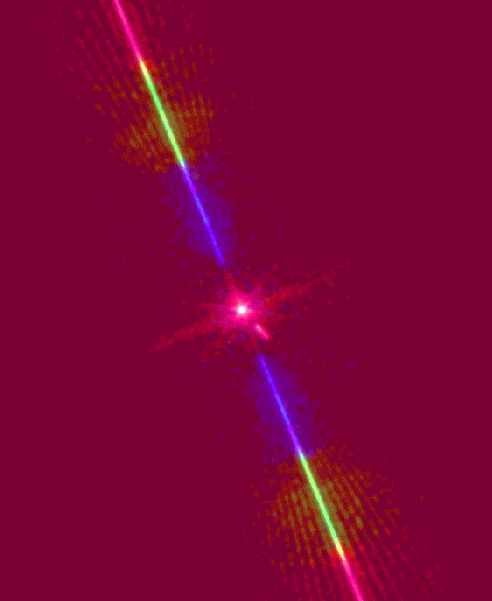 The small linear extention of the central point source to the bottom right is the famous X-ray jet of 3C273. A characteristic skewed, double-peaked iron line is emitted from the inner few Schwarzschild radii of the accretion disks of some Seyfert galaxies. The line is shaped by strong special and general relativistic effects and carries information about the size and orientation of the accretion disk. The time variability of such broad iron lines reflects the processes that occur when matter is fed into the black-hole.